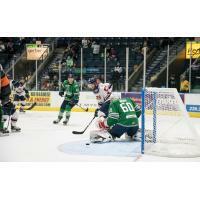 ESTERO, Fla. - The Florida Everblades announced on Friday that the Carolina Hurricanes have reassigned goaltender Jeremy Helvig to the Charlotte Checkers. This is the first career call-up for Helvig, who has posted a 4-3-3-0 record in 10 appearances for Florida in his rookie season. Helvig has compiled a 2.69 goals-against-average and a .902 save percentage with Florida and earned victories in three of his last four starts prior to being recalled. A fifth-round pick by the Canes in the 2016 NHL Draft, Helvig played the last four seasons in the Ontario Hockey League with the Kingston Frontenacs from 2014-18. The Markham, Ontario, native earned 81 career wins in 156 games with the Frontenacs.